Ofloxacin Ophthalmic Solution USP, 0.3% is a sterile ophthalmic solution. It is a fluorinated carboxyquinolone anti-infective for topical ophthalmic use. Chemical Name: (±)-9-Fiuoro-2, 3-dihydro-3-methyl-10(4-methyl-1-piperazinyl)-7-oxo-7H-pyrido[1,2,3-de]-1,4 benzoxazine-6-carboxylic acid. Contains: Active: ofloxacin 0.3% (3 mg/mL). Ofloxacin ophthalmic solution, USP is unbuffered and formulated with a pH of 6.4 (range - 6.0 to 6.8). It has an osmolality of 300 mOsm/kg. Ofloxacin is a fluorinated 4-quinolone which differs from other fluorinated 4-quinolones in that there is a six member (pyridobenzoxazine) ring from positions 1 to 8 of the basic ring structure. Serum, urine and tear concentrations of ofloxacin were measured in 30 healthy women at various time points during a ten-day course of treatment with ofloxacin ophthalmic solution. The mean serum ofloxacin concentration ranged from 0.4 ng/mL to 1.9 ng/mL. Maximum ofloxacin concentration increased from 1.1 ng/mL on day one to 1.9 ng/mL on day 11 after QID dosing for 10 1/2 days. Maximum serum ofloxacin concentrations after ten days of topical ophthalmic dosing were more than 1000 times lower than those reported after standard oral doses of ofloxacin. Tear ofloxacin concentrations ranged from 5.7 to 31 ug/g during the 40 minute period following the last dose on day 11. Mean tear concentration measured four hours after topical ophthalmic dosing was 9.2 ug/g. Corneal tissue concentrations of 4.4 ug/mL were observed four hours after beginning topical ocular application of two drops of ofloxacin ophthalmic solution every 30 minutes. Ofloxacin was excreted in the urine primarily unmodified. The safety and effectiveness of ofloxacin ophthalmic solution in treating ophthalmologic infections due to the following organisms have not been established in adequate and well-controlled clinical trials. Ofloxacin ophthalmic solution has been shown to be active in vitro against most strains of these organisms but the clinical significance in ophthalmologic infections is unknown. Conjunctivitis: In a randomized, double-masked, multicenter clinical trial, ofloxacin ophthalmic solution was superior to its vehicle after 2 days of treatment in patients with conjunctivitis and positive conjunctival cultures. Clinical outcomes for the trial demonstrated a clinical improvement rate of 86% (54/63) for the ofloxacin treated group versus 72% (48/67) for the placebo treated group after 2 days of therapy. Microbiological outcomes for the same clinical trial demonstrated an eradication rate for causative pathogens of 65% (41/63) for the ofloxacin treated group versus 25% (17/67) for the vehicle treated group after 2 days of therapy. Please note that microbiologic eradication does not always correlate with clinical outcome in anti-infective trials. Corneal Ulcers: In a randomized, double-masked, multi-center clinical trial of 140 subjects with positive cultures, ofloxacin ophthalmic solution treated subjects had an overall clinical success rate (complete re-epithelialization and no progression of the infiltrate for two consecutive visits) of 82% (61 / 74) compared to 80% (53/66) for the fortified antibiotic group, consisting of 1.5% tobramycin and 10% cefazolin solutions. The median time to clinical success was 11 days for the ofloxacin treated group and 10 days for the fortified treatment group. 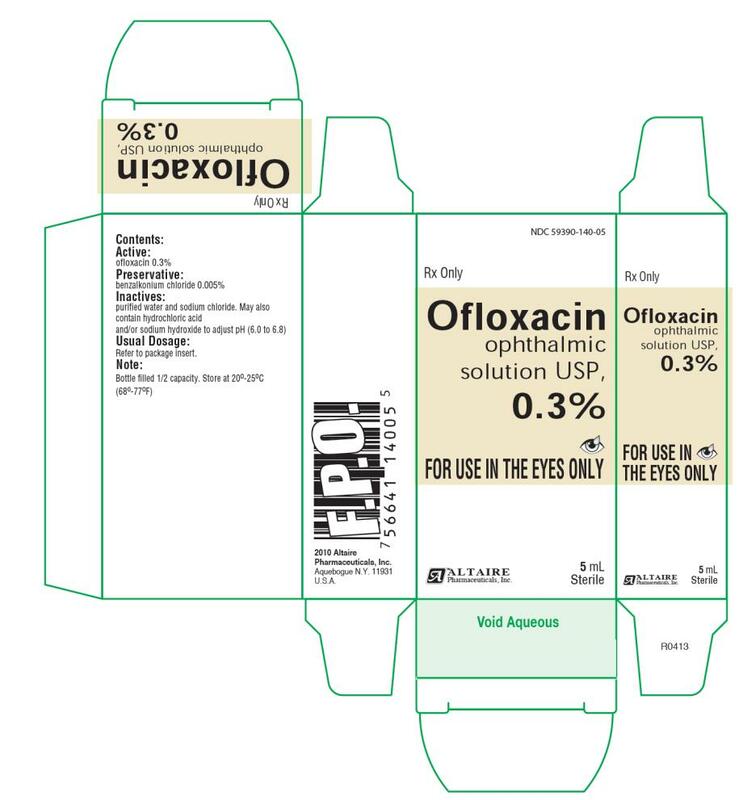 Ofloxacin ophthalmic solution is contraindicated in patients with a history of hypersensitivity to ofloxacin, to other quinolones, or to any of the components in this medication. Ofloxacin ophthalmic solution should not be injected subconjunctivally, nor should it be introduced directly into the anterior chamber of the eye. Ofloxacin was not mutagenic in the Ames test, in vitro and in vivo cytogenic assay, sister chromatid exchange assay (Chinese hamster and human cell lines), unscheduled DMA synthesis (UDS) assay using human fibroblasts, the dominant lethal assay, or mouse micronucleus assay. Ofloxacin was positive in the UDS test using rat hepatocyte, and in the mouse lymphoma assay. There are, however, no adequate and well-controlled studies in pregnant women. Ofloxacin ophthalmic solution should be used during pregnancy only if the potential benefit justifies the potential risk to the fetus.